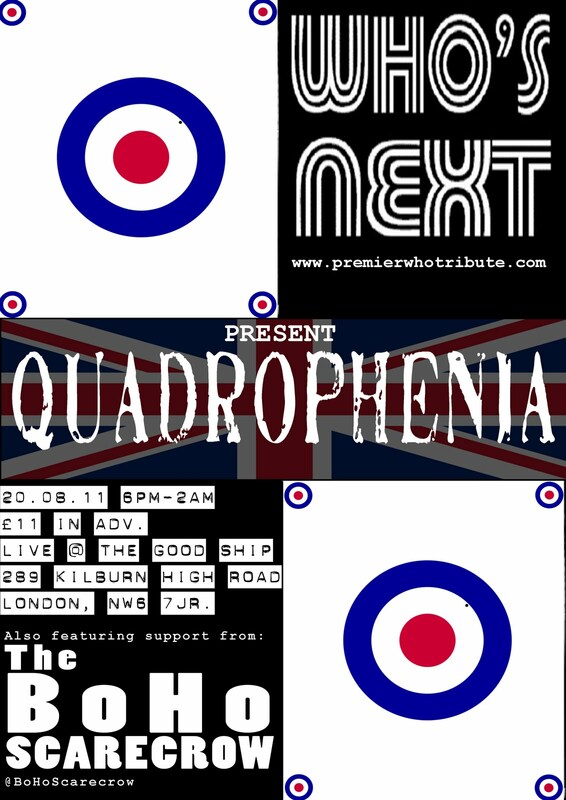 On August 20th, we're playing the Good Ship in Kilburn, supporting Who's Next who are performing the whole of Quadrophenia. We are going to have projections and I think that they are too, the stage at the Good Ship is theatrical pit with a huge blank space perfect for doing this. I have been rehearsing with Charlie Moon Fox who is going to be on drums for me. We have been rehearsing a 45 minute set including my micro opus (ho ho), Attack Of The Chevron Action Flasher: A Mini Opera. Charlie is playing some really good stuff. You can tell when he's really on it, because he starts to do these really visual drum moves. There's undoubtably sprinkle of that Moonie genetic magic in his veins. Charlie has one of Keith's old ride cymbals. It is the loudest thing in the room. It would be great if he had full set of those cymbals, he'd be devastating. We have been rehearsing over at Josh Townshend and James Manningly's Boston House Studio in Brentford. Its a bit out of the way for both Charlie and myself, but a good atmosphere and the location - that is to Minder, what 70s Manchester was to Life On Mars - feels appropriate. I think that we've got a couple of smoking tunes already. I'm playing mostly electric and it feels suitably wild but still reasonably dignified. We'll be showing some films before the gig. Haven't decided what yet. It should have some sort of relevance to Quadrophenia or Kilburn, I think. BUY MILLIONS OF THEM KIDS!!!!!!!! I think that this is going to be a lot of fun. I have been playing so much more music recently. Its like I've rejoined the musical fraternity. I went to see Blushing Bones on Monday. Lovely people. I did a gig last night at the Old Crown in Highgate Hill. It was good fun. A bit of an experiment but I want to do something bigger there in the future. What about a Bohemian Scarecrow Festival? Music, film and making scarecrows. 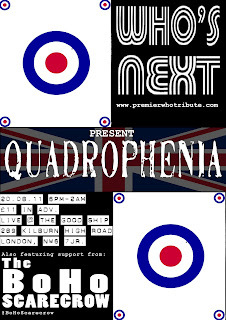 See you in Kilburn on the 20th!